Four new outbreaks of Newcastle disease were reported in Israel in the first week of December and resulted in the deaths of 5,700 birds, 4,400 were destroyed and 197,000 were slaughtered. An outbreak of Bovine Johne’s Disease (BJD) on a Queensland [Australia] stud farm has the farmer facing the prospect of slaughtering all of his 2 700 stud cattle. Some fear the outbreak could collectively cost Queensland cattle breeders tens of millions of dollars. About 400 people on board the P & O cruise ship Oriana were struck down by the novovirus winter vomiting bug. It is believed that 6 people boarded the ship with active symptoms. Most of the infected people were taken to hospitals immediately when the ship docked. A fast growing, flesh-eating fungus killed 5 people following a massive tornado that devastated Joplin, Missouri, USA in 2011, according to new studies by the U.S. Center for Disease Control and Prevention (CDC). The common fungus Apophysomyces, which lives in soil, wood or water — usually has no effect on people. But once it is introduced deep into the body through a blunt trauma puncture wound, it can grow quickly if the proper medical response is not immediate. Five of the 13 people infected through injuries suffered during the Joplin tornado died within two weeks. Yellow fever outbreak in the Ewo District in Cuvette-Ouest region, Democratic Repuclib of the Congo. Authorities have undertaken a mass vaccination programme. Hungary has tightened controls on maize designated as feed for dairy cows after discovering that some of the 2012 crop was contaminated by a toxin released by parasitical fungi. No people have yet been poisoned by the M1 variant of aflatoxin, a potentially carcinogenic product of the Aspergillus fungi species, and samples analysed from milk available to consumers have all been negative. As of 4 December, a total of 732 suspected cases of yellow fever, including 165 deaths have been reported in 33 out of 64 localities in Darfur. Yellow fever outbreak kills 164 in Darfur, Sudan. Chinese health officials ordered approximately 2,500 pigs to be culled over fears of a foot-and-mouth disease outbreak. Forty-three pigs were initially infected and died from the illness at a large pig farm near Dalian City in Lianing Province, China. In an update for the outbreak of ebola in Uganda, the Ministry of Health in Uganda reported 7 cases (6 confirmed, 1 probable) with Ebola haemorrhagic fever in Luweero and Kampala districts. Of these cases, 4 died. Authorities in the Democratic Republic Congo report that the Ebola outbreak has ended. There are now 10 cases reported in the latest ebola virus outbreak in Uganda, including 5 deaths in Luweero and Kampala. The outbreak of Marburg haemorrhagic fever in Uganda has claimed 9 lives in 4 districts in Uganda (Kabale, Ibanda, Mbarara, and Kampala). A total of 20 cases have been reported. An outbreak of dengue fever on the Portuguese island of Madeira has worsened as infections of the mosquito-borne disease accelerated. Reported cases of the potentially lethal disease rose to 1,672 as of Nov. 18. The disease is spreading due to many holiday makers returning home. Cases have so far been diagnosed in Britain, mainland Portugal, Germany, Sweden and France. The epidemic is the first sustained outbreak of dengue fever in Europe since the 1920’s. A coral disease outbreak along Kauai’s North Shore in Hawaii has been described as an epidemic by local scientists due to the large numbers of coral infected (59%). The disease appears to be caused by the large amounts of suspended solids in the water coming from nearby human habitation. A diseased piece of rice coral is pictured below. 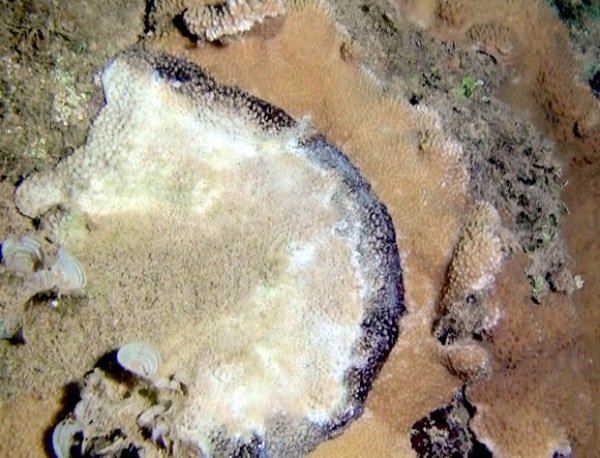 This photo shows a cyanobacterial/fungal disease attacking a piece of coral — the black ring is the disease, and the white area is the coral’s dead skeleton. Cholera kills 3 in southern Nigeria. Three people died in the southwestern state of Osun after being infected. Another 42 people were hospitalized in different centers across the region. In addition to the three dead in the latest ebola outbreak in Uganda, up to 15 people are being monitored for signs of the disease. Officials advised against panic after it was revealed that two possible Ebola patients had since checked into Kampala’s main referral hospital. First outbreak of a highly pathogenic bird flu virus in Australia in 15 years. Authorities hope that a cull of 50,000 chickens will contain the outbreak. It is not yet known what caused the outbreak at an egg farm in New South Wales. Japan has banned imports of eggs from Australia. The deadly Ebola hemorrhagic fever has broken out in the central Ugandan district of Luwero about one month after the World Health Organization (WHO) declared the East African country free of the disease. 185000 hens have been slaughtered to contain outbreak of a rare strain of salmonella on two commercial egg farms in Ireland. The strain of salmonella poses no threat to humans, but can cause substantial losses in flocks. Vietnam hand, foot and mouth disease outbreak surges past 100 000 cases. The CDC issues travel advisory. 31 people have now died and 424 have been sickened in the fungal meningitis outbreak linked to tainted steroid injections in the U.S.